It was a drug-free passing. That's the word from a British coroner who has ruled that Clash singer-guitarist Joe Strummer died in his sleep of a heart attack. And unlike many of his rock predecessors, Strummer's death was not drug-related, according to coroner Michael Rose, who announced his findings after conducting the autopsy last Tuesday. The singer, who cowrote some of the Clash's most politically charged anthems, including "London Calling," "Death and Glory" and "Know Your Rights," died December 21 in his home in Somerset, England, at the age of 50. At the time, his record label issued a statement saying Strummer "passed away peacefully." 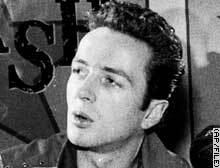 Despite the Clash's rebellious image, Strummer led a fairly straight life, reportedly preferring the occasional toke of marijuana to harder drugs like heroin and cocaine. He was also very much a family man to those who knew him. "This may be an unfashionable thing to say, but Joe Strummer was incredibly well brought-up and supposedly a really nice bloke," Andy Pemberton, editor of music magazine Blender, told USA Today. Pemberton noted that the rocker often helped ticketless fans get into concerts and even pitched in cleaning his own tour bus. A memorial service will take place Monday for the rocker, whose remains have been cremated. Meanwhile, the eulogies continue to pour in for Strummer, who was born John Graham Mellor in Ankara, Turkey. "Without the Clash, the whole political edge of punk would have been severely dulled," British folk-rocker Billy Bragg told Launch.com. U2's Bono, who collaborated with Strummer on the song "48864" honoring former South African President, Nelson Mandela, which they were supposed to perform together at a February 2 AIDS benefit concert, issued a statement praising Strummer and his bandmates as visionaries. "The Clash were the greatest rock band," Bono said. "They wrote the rule book for U2." Moby, meanwhile, offered the following on his Web diary: "[Strummer] had such a big heart and was without question one of the most important musicians of the last 50 years. Can you even imagine a world in which the Clash hadn't existed?" The Clash is set to be inducted into the Rock and Roll Hall of Fame early next year.